Talking about the structural ineffectiveness of charities and NGO’s is difficult because criticism of charity creates the problematic misconception that an individual is against easing the suffering of others, or the good intention to make the world a better place. This is not true. The problem is the wider framework within which charity occurs. "Photo Credit: develophaiti.wordpress.com"Talking about the structural ineffectiveness of charities and NGO’s is difficult because criticism of charity creates the problematic misconception that an individual is against easing the suffering of others, or the good intention to make the world a better place. This is not true. The problem is the wider framework within which charity occurs. In 2003 for example, Haiti’s debt service was $57 million, whereas the combined government spending for education, healthcare, environment, and transportation was $39 million—for a country of 9 million people. This continued the trend whereby Haiti’s poverty has historically produced a tremendous amount of wealth through debt and interest repayments, and now as a lucrative laboratory of NGOs. In order to bring about a development model which can really help reconstruct Haiti, while idealistic, NGOs should all work towards making themselves irrelevant. At the very least they should be monitored the same way that governments are, and have to engage with the communities to see what projects are needed, and not assumed. With the emergency phase of relief over, this means that they should not simply import foreign professionals to do the jobs that locals are capable of, or could be trained to do. Despite the best of intentions, importing teams of foreign nurses down to Haiti for example is a tremendous waste of resources considering airfare, accommodation, food, security—when Haitian nurses are sitting unemployed in tent camps because the state hospitals were doubly destroyed by structural adjustment and the earthquake. The debate regarding the depoliticizing of such a deeply political issue is something which needs to be discussed, as we must develop a system which allows us to move beyond the mere uttering of good intentions. The current shift to and promotion of philanthropy led development further justifies and naturalizes the system which allows an individual to become a multi-billionaire in a world where 80 percent of the world lives on US$10 a day. The focus is on the wrong end of the spectrum. We should not be congratulating the system which created a Bill Gates, Steve Jobs or Warren Buffet, but rather condemn the system which created the 5 billion desperately poor people. 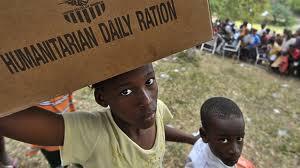 The reconstruction effort in Haiti has revealed that charity and goodwill has become a commodity. The process of helping to alleviate poverty and destruction has been turned into a business—a business which is predominately accountable to their donors, not the people they are entrusted to help. From my perspective, the lack of progress in Haiti should not come as a surprise, as the portrayal of a socially conscious and politically neutral NGO-led development model in Haiti is a perfect Trojan horse for the entrenchment of the most extreme neoliberal economic restructuring documented to date. The goals, vision, and business model of the transnational NGO’s are of increased dependency in Haiti, which is directly opposed to goals of the Haitian people who demand a development model which brings about both self sufficiency and allows for self determination. The role of NGOs in providing nearly all of the basic services in Haiti is an extreme example of neoliberalism in action—and it is failing the Haitian people miserably. The continued expansion of NGOs on the ground signals that for some, these are indeed boom times. Unfortunately, without a serious discussion about the nature of the development industry and NGOs, we can only expect the situation in Haiti to happen again elsewhere. Without changing the wider structure in which these NGOs operate, it is impossible to expect real, sustainable results. Haiti’s failed reconstruction is a beacon that NGOs cannot replace the state, and that any attempt to do otherwise is destructive and dangerous. The tremendous amount of NGOs in Haiti have increased the dependency of the Haitian people through undemocratic and non-transparent projects, which serve to entrench the neoliberal ideals of privatized governance, a reduced role for the state, and free mobility of both foreign capital and people—while Haitians stay trapped in the IDP camps. Vast amounts of aid money, which could go to support Haitian grassroots organization or the Cuban medical missions, are spent on frivolous and superficial expenses for temporary, foreign NGO staffers. The discussion about whether or not charity can exist within such an inhuman and exploitative capitalist system must be pushed to the forefront. While unpopular, it does force people to look into the true nature and motivations of charity in our current system. A simple donation to an NGO does not erase the crimes of history, which have created the divide between the rich and the poor. Haiti has become a microcosm of the problematic power relations between the first and third worlds. The causes are structural. The causes are deep. The public demands for the implementation of basic public health and educational systems are not excessive by any means, but are discussed in donor circles as unreasonable and downright radical programs. This is because such systems would marginalize the NGOs area of operations. The first step should be to work with the Haitian people, listen to their demands, and give them control over the reconstruction of their own country. Anything less should be considered another form of colonialism. Read part 1 of "Undeserved Confidence: A Broken System of Aid in Haiti." Kevin Edmonds is a NACLA blogger focusing on the Caribbean. For more from his blog, "The Other Side of Paradise," visit nacla.org/blog/other-side-paradise. Edmonds is a former NACLA research associate and a current PhD student at the University of Toronto, where he is studying the impact of neoliberalism on the St. Lucian banana trade.